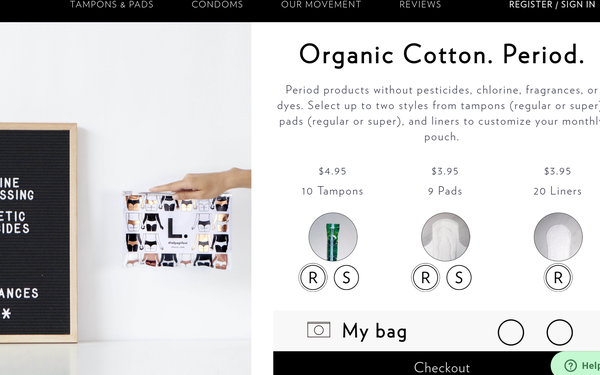 Procter & Gamble has acquired This is L, a San Francisco-based company that markets organic cotton tampons and pads and natural latex condoms. No purchase price was announced. This is an extreme example of a big company acquiring a smaller one. P&G has 95,000 employees, while This is L has seven. But L tampons, available via CVS, Target and 5,000 other stores, successfully capitalizes on the trend toward cause marketing and natural materials, like the fragrance-, chemical- and pesticide-free organic cotton the company uses, according to P&G. After returning home from "documenting humanitarian crises around the world," (according to the company's website) former photojournalist Talia Frenkel, the CEO, decided to market environmentally sensitive products to help the developing world. The first, in 2011, was a condom. Now, for every condom, tampon or pad that the company sells, it distributes one in a developing country through its network of thousands of female entrepreneurs, according to the company website. The donation program is headed toward distributing 250 million products worldwide. “Basically, it's a tampon you can really feel good about,” wrote Teen Vogue, which featured L in its March issue marking Women’s History Month. “Our strong growth has enabled us to stand in solidarity with women in more than 20 countries,” said Frenkel in a press release, sounding a little like the impassioned text of the Our Movement section of the This is L website. The company's ethos seems to mesh well with cause marketing efforts by P&G’s Always brand. Last August, Always launched its #EndPeriodPoverty campaign to distribute 15 million period products to school children. P&G says Always has given away 80 million such products around the world in the last ten years. “This acquisition is a perfect complement to our Always and Tampax portfolio, with its commitment to a shared mission to advocate for girls’ confidence and serve more women,” said Jennifer Davis, president, P&G global feminine care division, in a statement.